To Buy or Rent? What is the real deal? This is probably the most popular question that we get from out clients. 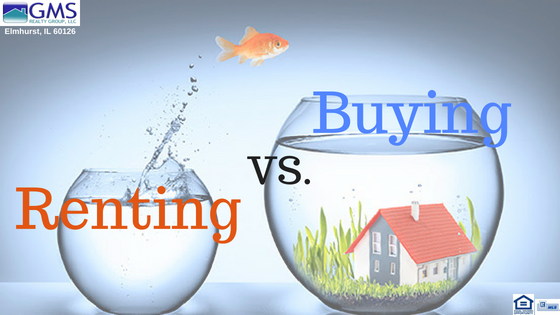 In this article we will be discussing briefly buying vs. renting, along with the major reasons why you should buy a home. Buy to beat inflation, improve your savings, build equity, save on taxes and enjoy more freedom. While some of these aspects have clearly been impacted by the recent changes in the tax code, they still apply. When looking at buying vs. renting, it is wise to remember that rents tend to go up with inflation & currently our economy is trending that way. When asking yourself if you should buy or rent , keep in mind that owning a home is a great hedge against future inflation. Rents in Chicago have been on the rise & renters are at the mercy of the market and their landlord. As an example, for 2018 the average rent in Chicago went up an astonishing 3% compared to last year’s average & while it might seem like 3% is not a big number, it sure does add up on the long run. Let’s take a $1500/month rent with a 3% yearly increase and you will be looking at $1725/month over the lapse of 5 years & at a stunning $2175/month at the 15-year mark. On the other hand, home buyers lock in a reasonable mortgage rates today and enjoy the peace of mind of knowing that their payments will remain constant for many years to come. Throughout the ups and downs of our economy, home ownership has been a good investment. Of course it’s not without risk and/or effort. Today’s market is full of options compared to previous times. In some cases you can become a homeowner with just 5% to 20% of the value of the property as a downpayment; perhaps, one of the best deals out there unlike the stock market or cryptocurrencies. Buying a home has for many years been considered to be the elevator to building personal wealth in America. Stop flushing money away on rent and start building equity with your money today. Every month part of your monthly mortgage payment goes to paying down the principal of the loan. So normally when the home is sold years later, the owner receives part of the investment back. Usually the principal paid plus money from any market appreciation. Compare that to rent which is a 100% expense. The main tax benefit of owning a house is that the imputed rental income homeowners receive is not taxed. Although that income is not taxed, homeowners may also be able to deduct mortgage interest and property tax payments along with other certain expenses from their federal taxable income.. Rent is of course 100% not deductible. In the long run, homeowners can make money on the sale of their home and take the profits tax free. The home must be your primary residence and the tax free profits are limited, but at this point it is still a strong incentive. 5. You can’t put a price tag on freedom, or can you? More freedom is perhaps the best reason for buying instead of renting . Don’t like the yellow tub with the pink tile? Renovate it! Owners are free to make significant changes they want in their home. Renters must just live with how it looks & settle for what they are given. There is really something special about the feeling of owning your home. It comes down to feeling free. We Americans like freedom. Owning gives us more control to do what we like. So if you’re asking should I buy or rent, remember to consider the intangible benefit of feeling free. Everyone's wants, needs and circumstances are different and that is why there is no one-size-fits-all answers to this question, but here are some things to take in considerations in order facilitate the decision making process. If you’re unable to commit to living in one location for at least 3 years, buying a home now is probably not for you. Because it’s not likely your home will appreciate enough to offset the significant transaction costs of selling. If renting is the way to go for you, we are always happy to help at any time. On the other hand while there are steps that need to be taken in order to purchase a home it is important to look deeper into your opportunities. Many people believe they cannot get a mortgage or that they do not have enough money for a down payment. That may be true but there are government programs that assist people to buy with as little as 3% down. We’re not advocating that approach but where there’s a will there’s a way. If buying a home is something that you are interested on, let’s get together and discuss the possibilities of making this desire become a reality.